Join us at the Museum Sunday, November 12, 2017 to celebrate a unique group of American women who answered the call to serve their country in what was then possibly the most radical way possible. By the end of World War II, members of the WASP’s – Women Airforce Service Pilots – would have logged time in just about every type of aircraft in the U.S. armed services inventory, from frontline fighters to heavy bombers. 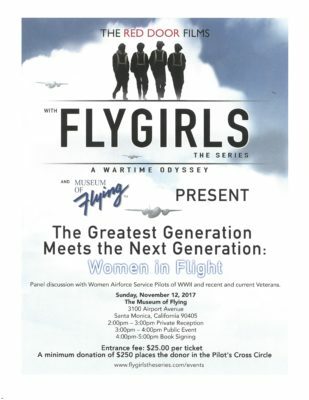 The link below will take you to the website of Red Door films, which is producing a series called ‘Flygirls’ based on the exploits of these valiant ladies.